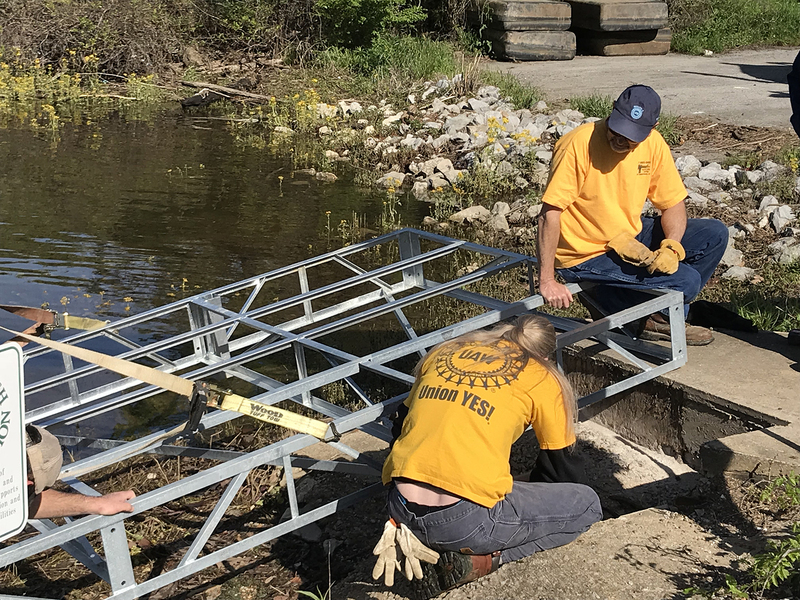 Working with the Union Sportsmen’s Alliance and other Chattanooga-area unions, UAW Local 42 recently completed a project to install a new and improved courtesy pier at the Wolftever Creek Boat Ramp adjacent to Harrison Bay State Park on Highway 58. A dozen Local 42 members joined volunteers from the IBEW, Sheet Metal Workers, and Iron Workers unions to demolish the existing pier and install a new pier. 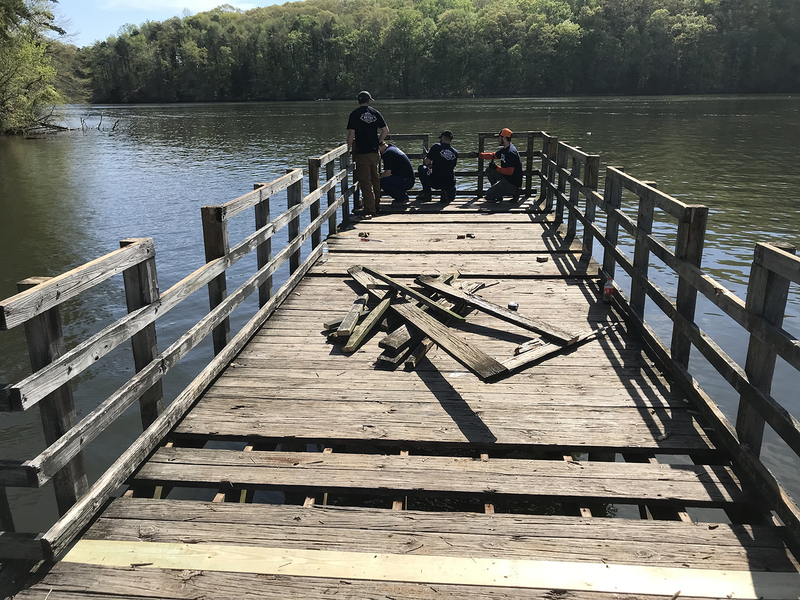 On Saturday April 7, volunteers demolished and removed the old dock, which had rotting and missing deck boards and was unusable in the winter when the water level is low. Using cutting torches, pry bars, chain saws and sawsalls, volunteers cut the 60 feet of ramp into pieces that could be hauled away. Two weeks later, the new dock was delivered in eight pieces on a flatbed semi-truck. A reach forklift placed each piece in place while volunteers bolted them together and drove anchor posts into the shore. Composite deck boards were screwed down and aluminum rails installed. The new pier is 104 feet long, making it usable year round. Region 8 Director Ray Curry agreed. “In a short period of time, Local 42 has become a leader in the Chattanooga community. 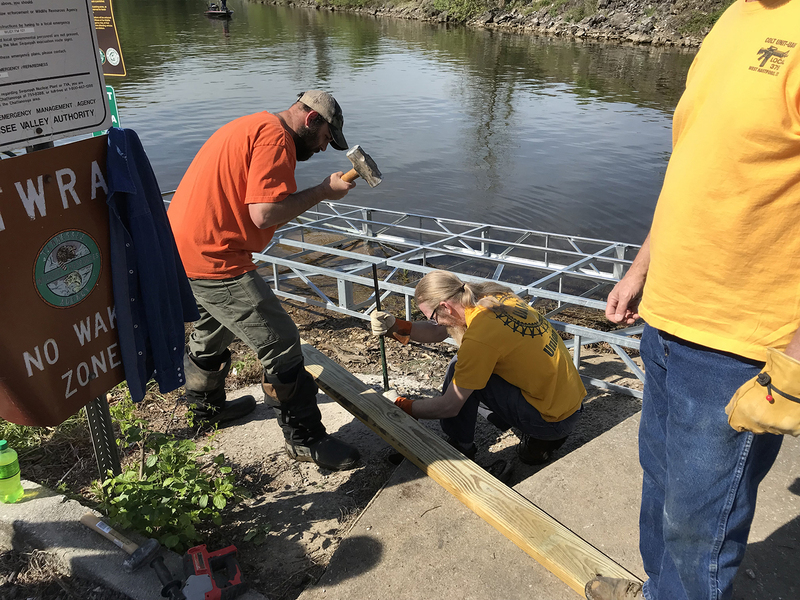 Not only did the local raise the money for this new pier but they pitched in and helped build it.” Local 42 raised $10,000 toward the pier at the Sportsmen’s Banquet last November.